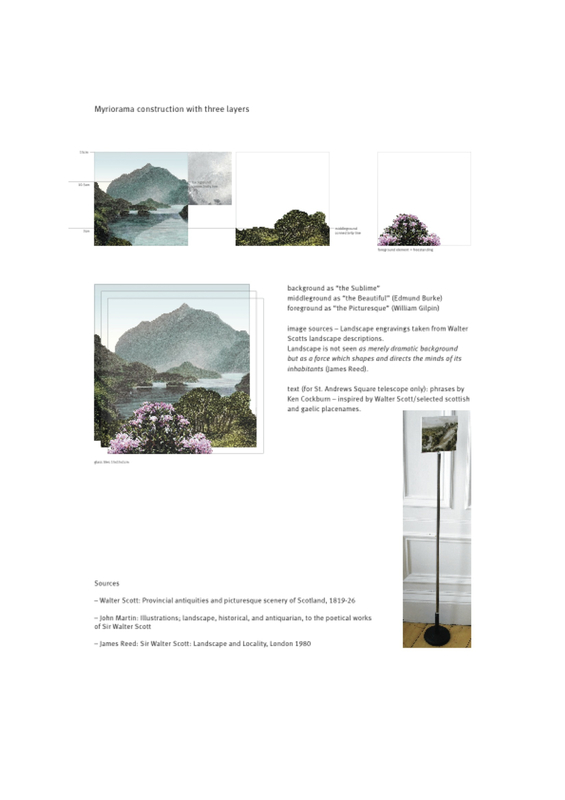 ‘Composite Landscapes’ is a paper on my work with artists ~in the fields, which I delivered at the conference Writing into Art held at the University of Strathclyde and Kelvingrove Museum and Art Gallery, Glasgow, on 18–19 June 2013. Since 2008, I have collaborated on several projects with the artist collective ~ in the fields, Nicole Heidtke and Stefan Baumberger. Their work, in their own words, “emphasizes natural phenomena and condenses poetic moments into inventions of closed systems”. Their visual art practice draws on archival material and often involves environmental topics. 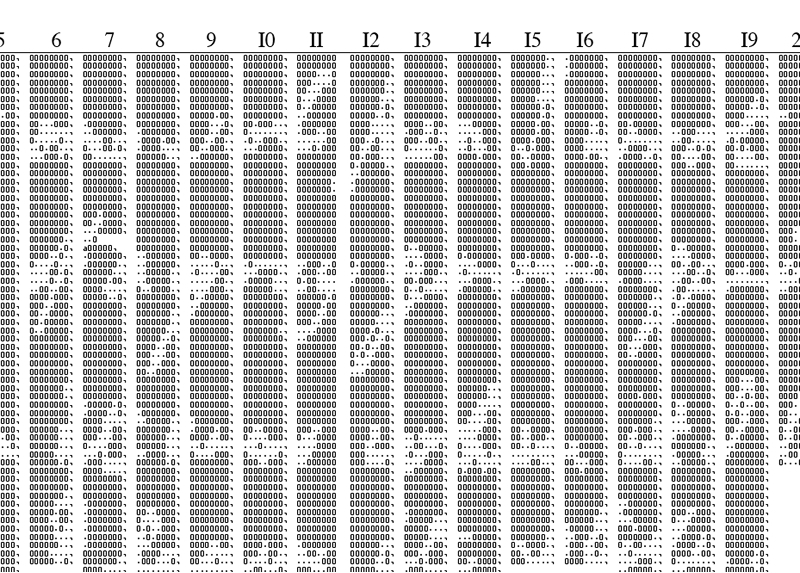 Our collaborations include a publication, an exhibition and public art projects, and I would like to consider some of the approaches to writing these different projects suggested, in terms of our collaborative methods, as well as the ways in which the content, form and sequencing of the resultant texts developed. In particular I’ll consider two works: ink, for which text, written in response to an extant sculptural work, features in and shapes a book publication; and yen to see distant places, an interactive work made for an exhibition last summer at New Media Scotland, Edinburgh. Our initial connection was a shared interest in the relationship of the handwritten inscription to the printed book – the individual to the mass-produced. I wrote a sequence of poems, On the flyleaf, notionally written in and relating to particular books, and I continue to have an interest in marginalia – readers writing in books. 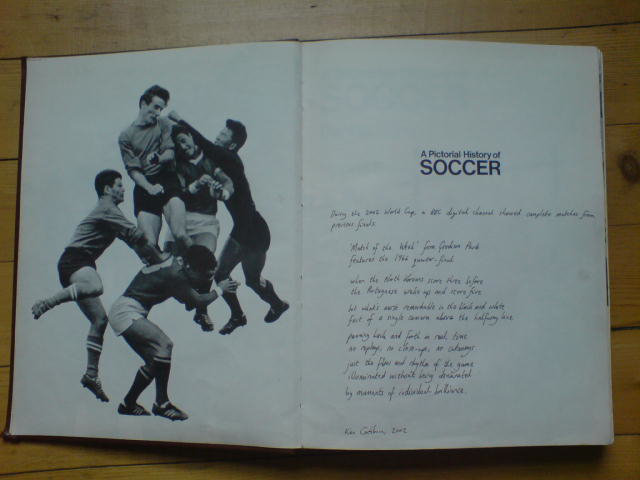 The image above features one of the ‘flyleaf’ poems. And a pen I leave it still. 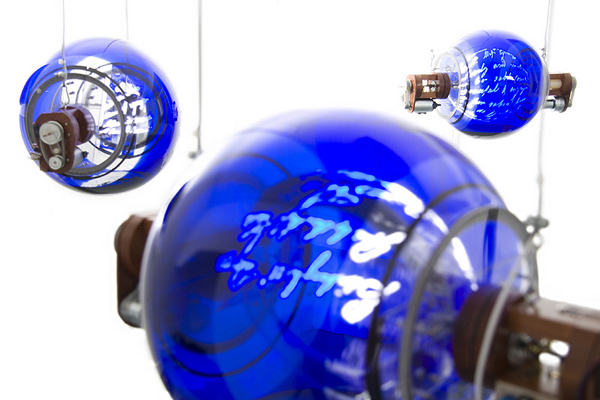 Ink – the sculptural work – consists of five colourless clear glass bulbs – each partly filled with blue ink. When the visitor approaches, the bulbs begin to rotate, causing a layer of ink to coat the inside surface. 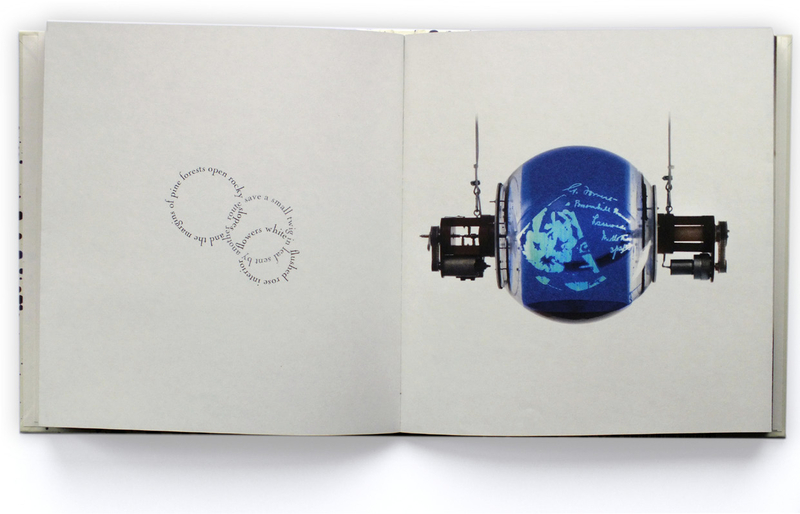 Through the ink, illuminated handwritten inscriptions become visible on a spinning armature – a rotor with LEDs which pulse very quickly – and the inscriptions are given to the visitor individually. The visitor’s presence initiates the offering of the inscription once again. 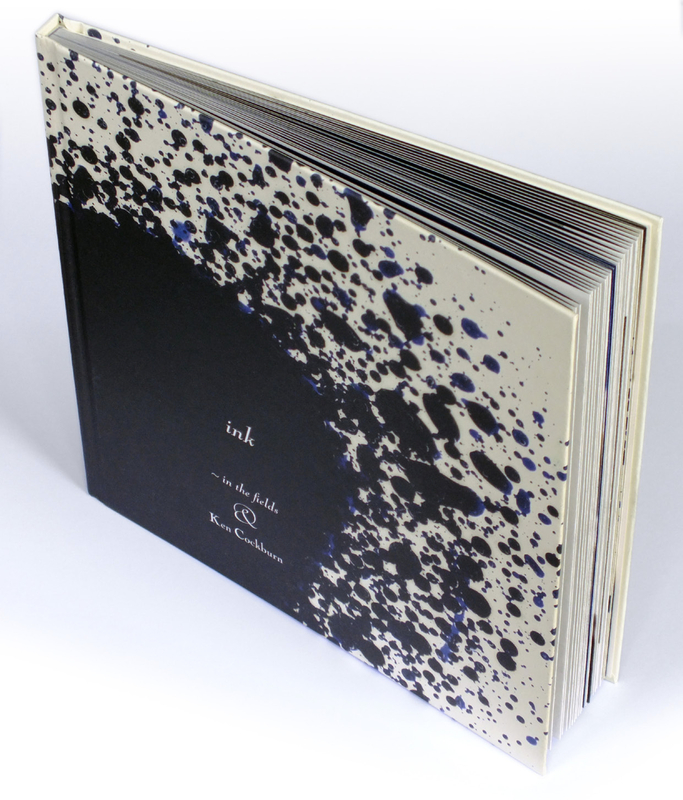 In the book Ink, images and texts relating to the sculptural work ink are augmented by texts by myself – original poems, found poems and reflective prose – which consider the sculptural work itself as well as the related topics of marginalia and the colour blue. An alphabet poem – on imaginary shades of blue – came to define the structure and extent of the book. 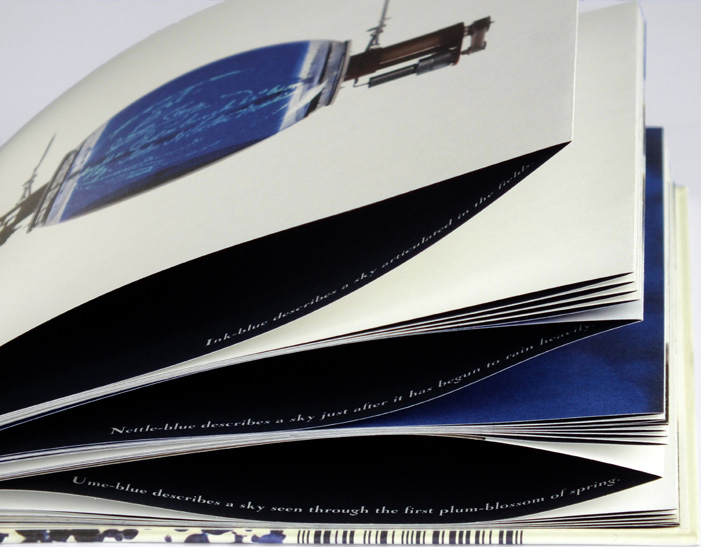 The book is bound using French folds – the main text is all printed on one side of the paper – but between the pages, as it were, there is a background text – the alphabet poem – glimpsed out of the darkness. The book is 52 pages, so two pages for each letter of the alphabet. The poems in the book move off in different directions from the sculptural work. 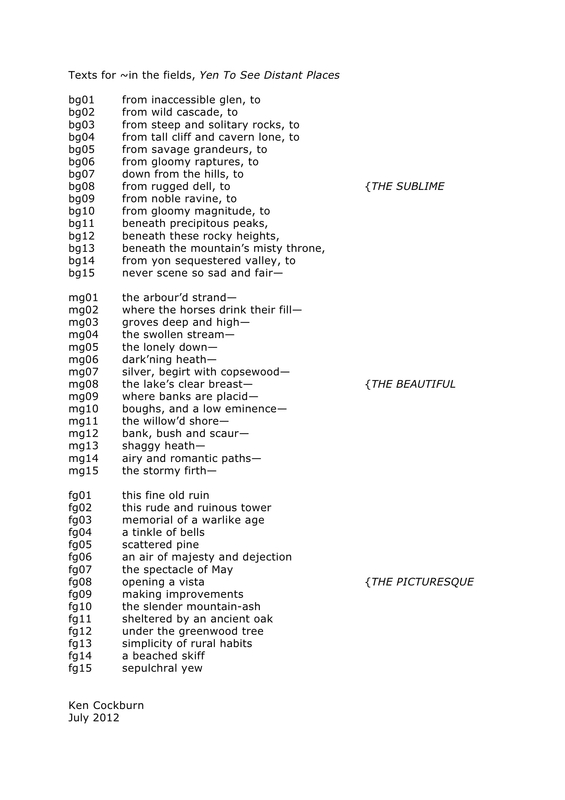 As well as the blue alphabet, there are found poems using parts of the handwritten descriptions; these additionally reflect the globes of sculptural work by being presented as circle poems, a form I had previously attempted without much success, but which seemed to work for me in this context. There are also poems reflecting on the sculptural work directly – on movement – on the propriety, or otherwise, of writing in books – and on the happenstance of the collaboration occuring in the first place. Here are two short poems – original, rather than found – from the book. It felt like a gift, such an encounter, out of the blue. yen to see distant places from 2012 projects composite landscapes drawn from early 19th century etchings of Scottish landscapes, creating – perhaps somewhat in the manner of historical fiction – an image each of whose elements is based in reality, but which has never yet appeared in quite this context or combination. Each composite image consists of three elements – background (The Sublime), middleground (The Beautiful) and foreground (The Picturesque). Here are some of the backgrounds. 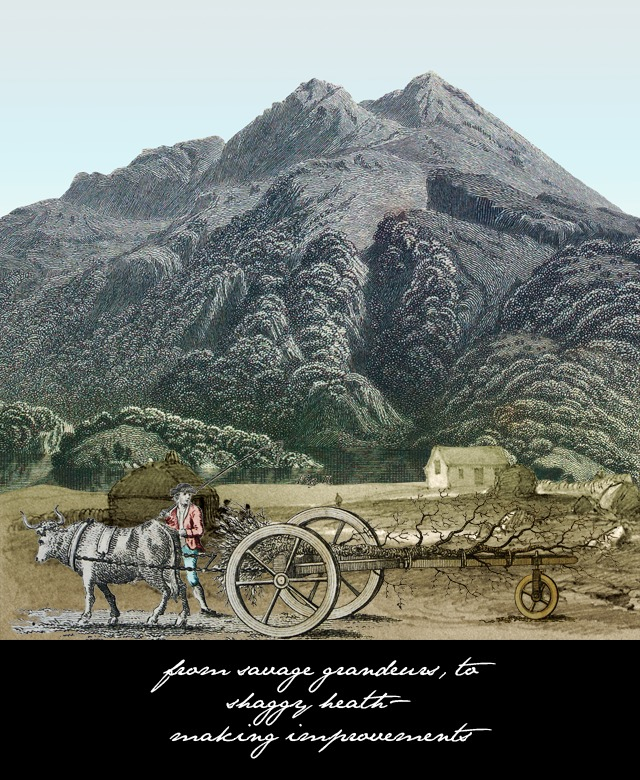 Individual elements are sourced from different books, mainly Walter Scott’s Provincial antiquities and picturesque scenery of Scotland: with descriptive illustrations, published in the 1820s. Other sources are books from the Botanic Garden Library, for example, Scottish trees with a history or a connection to a famous place. There are also some landscape drawings by Robert Kaye Greville (mainly for ‘the beautiful’) from the 1830s. 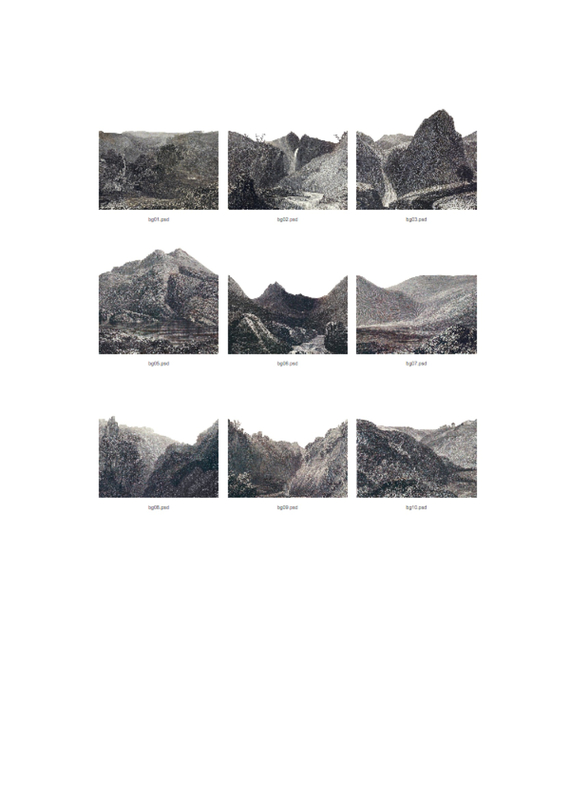 Fifteen images were selected, and individually coloured, for each element, and thus in total there are over three thousand possible combinations(15x15x15), or composite landscapes. 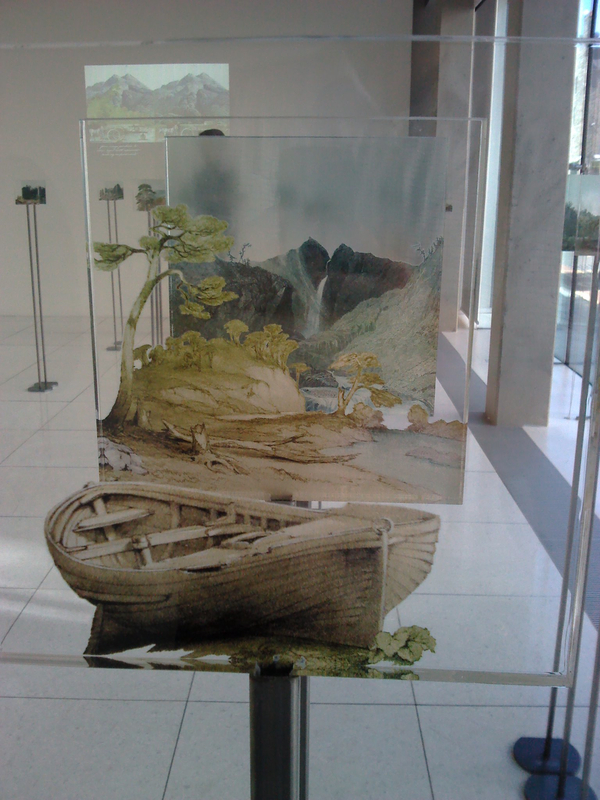 The idea is also that the composite images can also connect horizontally to form a continuous landscape, or ‘myriorama’ – an idea taken from 19th century sets of cards featuring landscapes, which could be placed in any order and still produce a coherent image. I was originally asked to provide a short caption or title for each image, but in fact produced a short poetic line, mostly taken or adapted from the work of Sir Walter Scott and other Romantic writers. Like the images, these lines were adjusted so that when combined they form a composite three-line verse, or Romantic haiku. The first and second lines – background and middleground – are linked by prepositions ‘from x to y’ – with the third line following after a dash, thus precluding the need for more specific syntax, yet qualifying the previous couplet in some way. Here is a shot from the exhibition. You can see how each of the images is presented on a glass screen on a pole. When these are moved into a certain position, they are projected on to the screen at the back as a combined image, and the text appears with them. 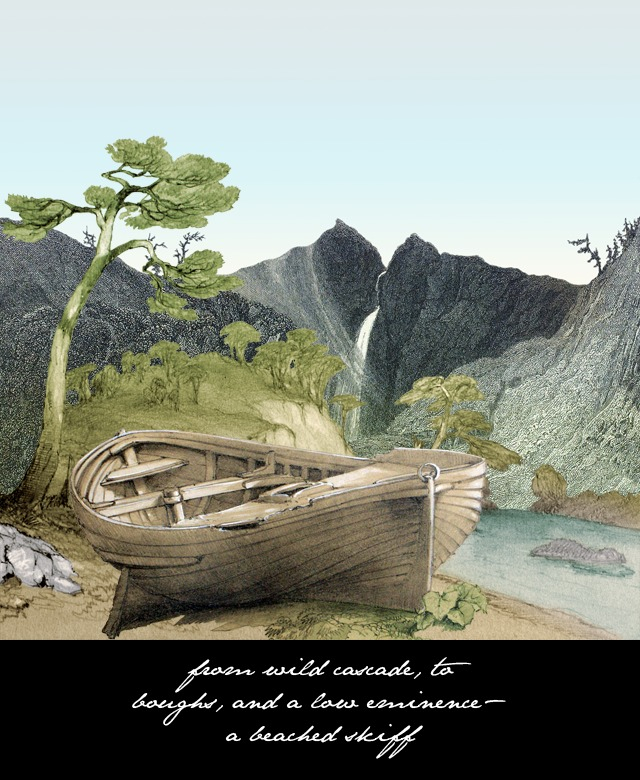 Here is the composite landscape, and poem, formed from the three elements in the bottom right of this image. 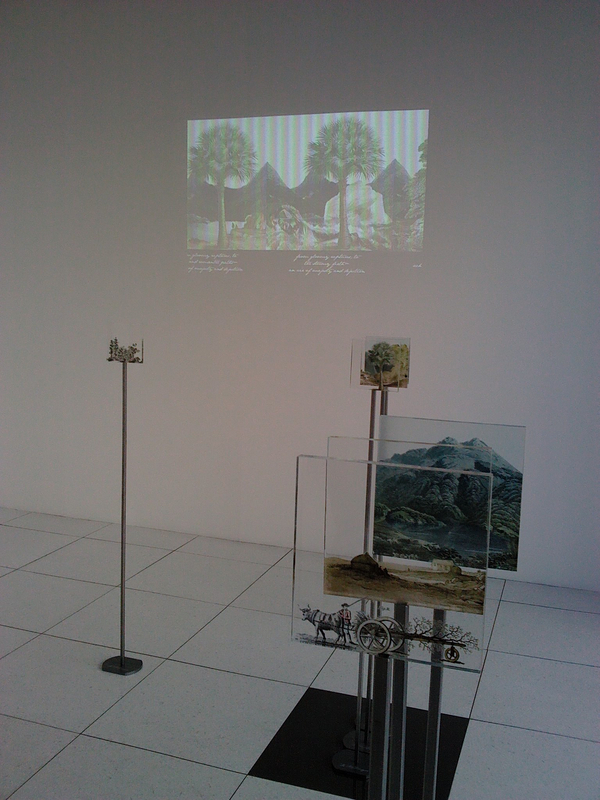 Another exhibition shot of the three elements – and the composite landscape which they form. 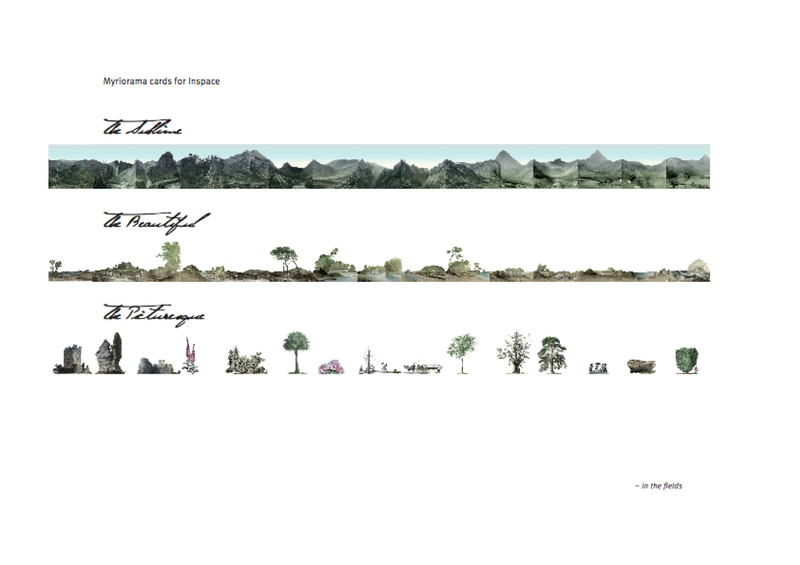 Here are a series of images, as presented on the screen during the exhibition, shifting from right to left. 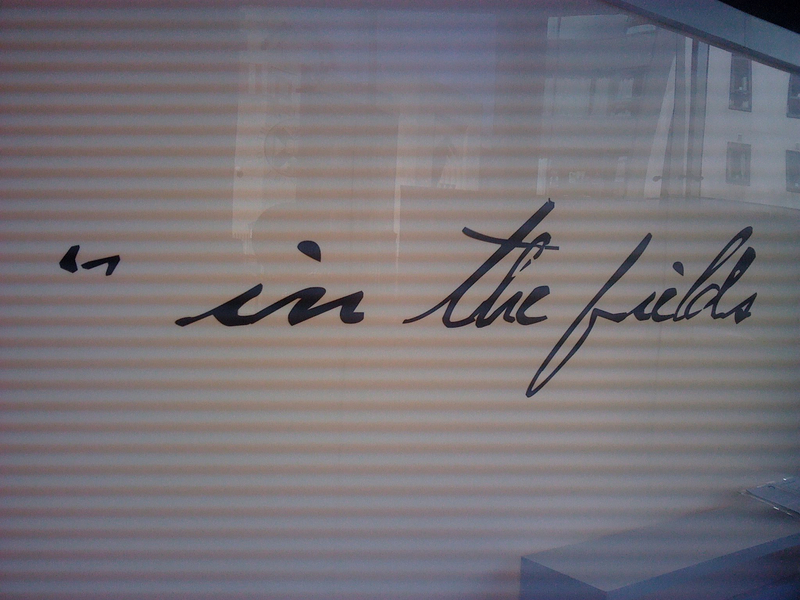 In this case, the user experience is very different from that of ink, as they participate and create one image out of three parts, anticipating what the composite image will look like and seeing this as a part of an ongoing panorama, and then being surprised by the related poem they have also “composed”. To conclude: poetry is about structures, about form as well as content, and sometimes the most interesting way of producing content is to focus on the form, and let the content as it were come of its own accord. I enjoy the way ~in the fields focus on thinking through and making their highly conceptualised and technically ambitious works, and I hope the poems can work in similar ways, as intricate machines which fascinate in terms of both their engineering and their output.